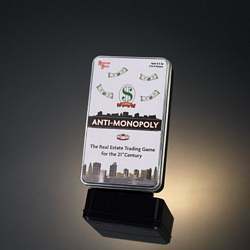 The real estate trading game for the 21st Century. A very modern-day twist on a classic game with two groups following different rules in their quest for big money! Free market competitors clash with ruthless monopolists. In the real business world, competitors and monopolists work hard to increase their incomes - but they go about it in different ways. Competitors sell more goods at a fair price to make a fair profit.